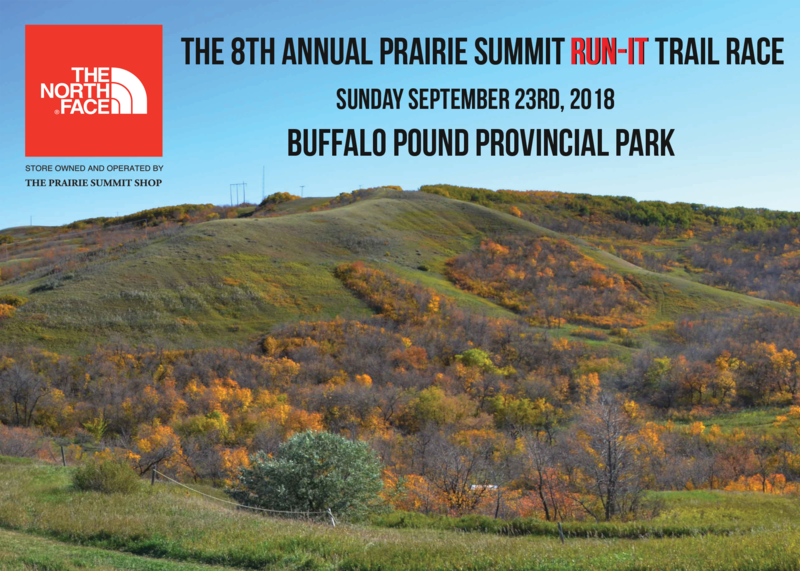 Our 8th Annual Prairie Summit Run-It TRAIL RACE Is Sunday September 23rd. Choose the 5km, 10km or 20km distance or bring the kids for the fun run, ages 3-12. A challenging, hilly course through the wonderful scenic trails Buffalo Pound has to offer. Meadows, trees, and great views! There will be 3 age divisions for the 3 distances, Up to 21, 22-39, 40+ * * 20km Race starts at 10:00am** The 5 & 10km start at 10:20am, kids fun run taking place at noon. T-shirts are included in the 10 & 20km race fees. If 5km racers would like to purchase a t-shirt they are $20 and available on the registration site. Race Registration is through Zone 4, click here to register! Prairie Summit Shop, The North Face Regina, is proud to support the Greenall Outdoor School program with the proceeds from this event. The Greenall Outdoor students graciously volunteer their time each year to help with trail maintenance, set up, and clean up each year. Thanks to your participation in this event, we are able to raise anywhere from $3000 to $5000 for this great program each year and we are able to donate to the Buffalo Pound Trail development and maintenance and support the Canadian Ski Patrol. There is no post race meal. We do have a offering of snacks and fruit, grilled cheese sandwiches, milk, water, and Gatorade. Feel free to pack a cooler for a post race tailgate party and take in the afternoon at the park, there are picnic tables around the race area to use but we recommend bringing lawn chairs. For 2018 we are honored and proud to name the 5km race after a former Greenall ODS student Lane Antosh. Lane’s family have participated in the event each year and we would like to encourage others to run for Lane, or a loved one of your own. Lane Antosh’s life was tragically cut short during the summer of 2013 when he was involved in a car crash on the #1 Highway near his home town of Pilot Butte. Lane was a loving brother and son. He loved playing Minecraft, he was involved with Scouts and was a strong advocate for kids with Asperger’s. During his time with the Greenall Outdoor School (ODS), Lane was an inspiration to his classmates and instructors. Lane was the first person to contribute to class discussion and the first to volunteer to help a fellow classmate or instructor. Lane, was compassionate, caring and brave and his contributions to ODS will never be forgotten. Parents get your kids ready to run! We will have a fun kids race for ages 3 to 12. It's FREE and all racers will get a prize pack for participating. 3-6 year olds will be doing a loop in on the trails, approx 400 M, and the 7-12 year olds will be doing a out and back on the trails plus a loop of the campground for approx 800M. Parents are encouraged to run with their kids and the race will take place at 12 noon. FROM REGINA: Drive WEST on HWY #1 towards Moose Jaw. Exit to the right for HWY #301 North, then turn right onto HWY #301. Stay on this road until you come to the park entrance. FROM MOOSE JAW: Drive NORTH on HWY#2. Then turn RIGHT onto HWY #202 EAST and drive until you reach the park entrance. FROM SASKATOON: Drive SOUTH on HWY#11. When you go through the town of Chamberlain, turn RIGHT onto HWY#2 SOUTH. Then turn LEFT onto HWY#202 EAST and drive until you reach the park entrance. Pre-race packet pick up will be available on either: Friday, Sept. 21st between 9:30am-5:30pm or Saturday, September 22nd from 9:00am-5:00pm at The North Face - Regina 2018 Park Street (next to Shopper's Drug Mart) Regina, SK S4N 2G6 Race day packet pick-up will also be available for out of town registrants, please notify us ahead of time. Huge thanks to THE NORTH FACE for their continued support of this event and their amazing prizes! We would also like to thank SMARTWOOL CANADA and CLIF BAR, for their prize donations. We would also like to sincerely thank SASKMILK and Caliber Coffee for their food donations and support for our event.